Background: Protein-Protein interaction (PPI) network analysis of virulence proteins of Aspergillus fumigatus is a prevailing strategy to understand the mechanism behind the virulence of A. fumigatus. The identification of major hub proteins and targeting the hub protein as a new antifungal drug target will help in treating the invasive aspergillosis. Materials & Method: In the present study, the PPI network of 96 virulence (drug target) proteins of A. fumigatus were investigated which resulted in 103 nodes and 430 edges. Topological enrichment analysis of the PPI network was also carried out by using STRING database and Network analyzer a cytoscape plugin app. The key enriched KEGG pathway and protein domains were analyzed by STRING. Conclusion: Manual curation of PPI data identified three proteins (PyrABCN-43, AroM-34, and Glt1- 34) of A. fumigatus possessing the highest interacting partners. Top 10% hub proteins were also identified from the network using cytohubba on the basis of seven algorithms, i.e. betweenness, radiality, closeness, degree, bottleneck, MCC and EPC. 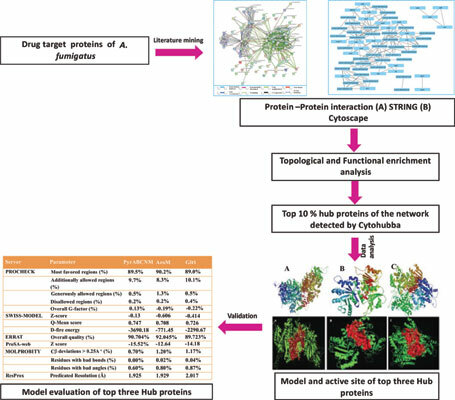 Homology model and the active pocket of top three hub proteins were also predicted. Keywords: A. fumigatus, Aspergillosis, STRING, Cytoscape, Hub proteins, Invasive aspergillosis. Keywords:A. fumigatus, Aspergillosis, STRING, Cytoscape, Hub proteins, Invasive aspergillosis.